"Softening momentum, high uncertainty" is the key takeaway from the International Monetary Fund’s January 2019 World Economic Outlook. One reason is that outside the United States, industrial production has decelerated, particularly of capital goods. This is why alarm bells are ringing in a lot of industrial equipment (IE) companies. Additionally, executives should consider the long-term trends as well, which is that the Internet of Things (IoT) will speed up the trend towards the outcome economy. Customers are expecting their suppliers to take more responsibility in improving their outcomes, which is described in the TSIA book B4B: How Technology and Big Data Are Reinventing the Customer-Supplier Relationship. Smart, connected devices and equipment, which are embedded within the customer’s entire technological ecosystem, enables the ability to analyze and predict the performance of equipment in the field and to deliver a guaranteed outcome to that customer. It's these connected devices, equipment, or ecosystems that will reach new levels of productivity and avaialability. To give industrial equipment companies guidance on their most critical initiatives, TSIA analyzes all member inquiries and allocates them to business challenges, which in turn allows us to identify the top business challenges impacting the industry. When you consider that industrial equipment TSIA member companies have a stronger focus on services than the other companies in the industry, this is a real early indicator of trends in services. Here are the top three business challenges TSIA has identified that are the most critical for industrial equipment companies to solve. The 3 biggest challenges for industrial equipment manufacturing. This includes creating premium support offerings, connecting service offers to business value, and launching new service offers. By making this challenge a priority, this shows that industrial equipment companies are taking more responsibility for improving customer outcomes with premium and platinum support offers and that they need to prove their value in order to sell these offers. Additionally, more industrial equipment companies are launching new service offers or bundling them into their premium support offers. Examples of these are platforms that manage the fleet and assets of specific technology and services to optimize the value of devices or equipment by improving the processes in which they are embedded. It’s important for all companies to benchmark with peers to understand which practices drive improvements and to define the most promising initiatives. That way they can prioritize those initiatives and to set realistic but ambitious goals. This is beneficial for both specific service lines and for the global service structure. Providing IoT-enabled services requires collaboration between multiple service lines, including Analytics, Software Engineering, and Software Support. Additionally, the collaboration between Sales and Services is changing dramatically. The core role of Sales is to land new customers, but that’s just the beginning of the customer relationship. All other steps in the customer life cycle belong purely to a Services role or may be joint initiatives between Sales and Services, such as contract renewal and/or expansion of customer spending. Based on member inquiries, TSIA has also identified two additional key business challenges that industrial equipment organizations are experiencing, which primarily have to do with creating value and outcomes for their customers and how to leverage IoT. Instrument manufacturer in TSIA IE40 index. Machine manufacturer in TSIA IE40 index. When we compare these two figures YoY, we see a stable service revenue share for both instrument and machine manufacturer peers, while the instrument manufacturers lost 1% in service margin and the machine manufacturers gained 2.5% service margin from a low level. This shows in a robust economic environment, the competition for service offers. Instrument manufacturers struggle to increase their service share and to defend their margin. Machine manufacturers could close the gap in the service margin to other industries, but only slightly. To fight competition and commoditization of service offers, the launch of new services require a clear understanding of the value created for customers. A lot of Services organizations within industrial equipment companies are struggling with the habit of giving away services for free as a discount for the product deal, as well as providing too many services as warranty. The first step to fighting against the internal drivers for this problem is understanding and communicating the value of the services for your customers. You’ll then need to create a path to move from “free to fee.” If you need help with your “free to fee” strategy, please be sure to reach out to TSIA to learn how we’ve helped our members streamline their offer portfolios for better monetization and improved customer outcomes. If you know the value you’re able to bring to your customers, you can better help them improve their processes and outcomes as an engine of corporate growth. 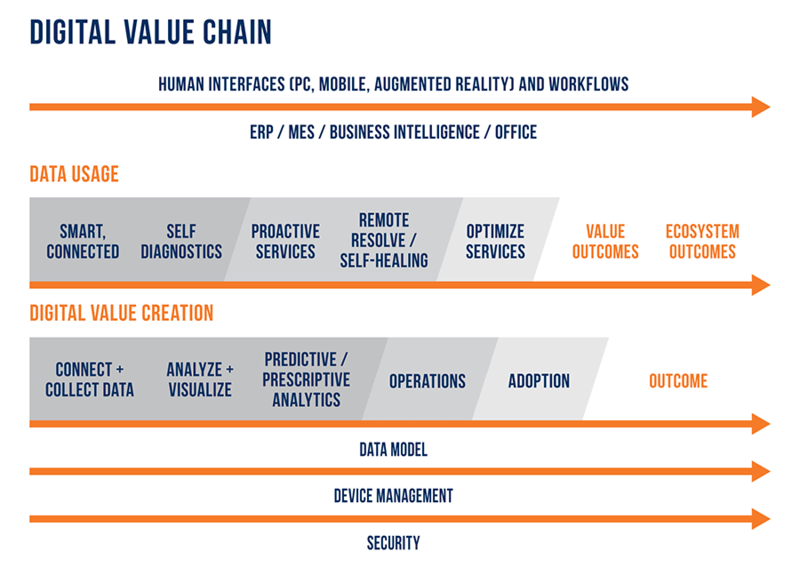 This gives services at least the same focus as your product business, creating opportunities for corporate growth and increasing the service revenue share, especially when you leverage IoT, the second-fastest growing business trend (and challenge). Industrial equipment companies are leveraging the Internet of Things (IoT) to increase service efficiency and to help customers improve their processes and outcomes. While improving service efficiency is an important ongoing challenge, assisting the customers with improving their operations and outcome realization offers the opportunity to create new revenue streams. Information services and cloud services, can help predict failures, generate recommendations for improving the adoption of technology, and to improve the outcome. The traditional product business in industrial equipment followed a “Make/Sell/Ship/Implement” model. In a model of smart, connected products and equipment, digital services are provided as a subscription offer, the customer relationship begins with the initial deal, creating a brand-new business model. For more about how to manage and solve these business challenges and more, I hope you’ll join us at TSIA’s upcoming Technology & Services World conference, taking place in San Diego, May 6-8. There, I and TSIA’s VP of Field Services research, Vele Galovski, will be sharing our latest research and participating in discussions about developing trends in IoT, industrial equipment, field services, and more. In particular, be sure to check out Vele’s Power Hour on Monday of the conference, “How the Digital Transformation is Wrecking OEM Business Models.” There’s still time to register, and if you do so before February 28, you’ll receive a 20% discount. I look forward to seeing you there!